The Paradigm hosta is a combination of many of the colors found in other types of hostas. Its pale lavender blooms rise above golden leaves that are bordered by blue and green streaks. These unique features made Paradigm the 2007 Hosta of the Year. 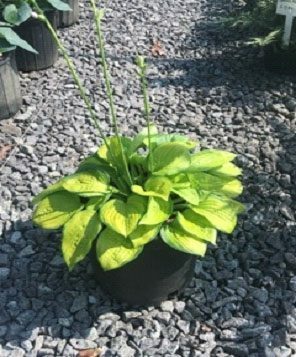 This hosta is perfect for gardeners and homeowners who want to attract hummingbirds and butterflies to their property. The long blooming season (from June to September) means you’ll have many days to enjoy the beauty and color of this natural treasure. Paradigm grows to a height of approximately 15 to 18 inches and a width of approximately 20 inches. Visit Rolling Hills Nursery & Landscaping to check it out and see if it’s a good fit for your property.